If you’re just staring out on the maritime industry, this is the bottom rung on the ladder. In families long in boating tradition, children usually start in this job and work their way up to becoming the owner of the ship. He is one of the unlicensed members of the deck department and the main duty is maintaining the cleanliness of the whole ship.Being an ordinary seaman is an apprenticeship for one to be promoted as able seaman. An ordinary seaman should work for a specific period referred to as “sea time” before he will be allowed to take certain courses and trainings to gain a higher rank. Paints, buff and scales decks and ship’s structure. The metal properties of the ship is always at risk of developing rust and being damaged because of constant contact with sea water. The Ordinary seaman needs to spend a lot of time removing rust and fixing damages of affected areas by using paints, sealants and primers. Ensures that the ship’s deck is free of water and dirt. The ship’s deck is often filled with sea water which is a hazard because the water and salt can make the floor dirty and slippery. The sea water also cause the deck to accumulate rust faster and can damage the ship’s equipments. 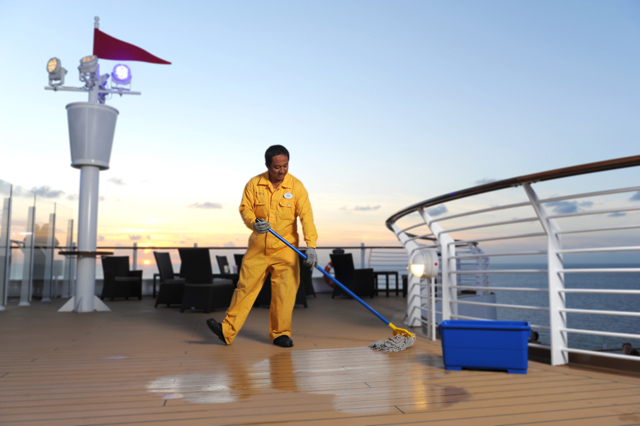 Sweeping and washing the deck is one of the many duties of the OS. Splice and knot wire and rope. The skill of tying the knot is one of the most identified skills of an Able Seaman. As being an OS is an apprenticeship, he is asked to demonstrate his knowledge of knot tying under the auspices of senior members of the deck department. Loads and Unloads Cargos. The job of an ordinary seaman involves moving heavy cargos and large equipments. The types of cargos and equipments that an OS needs to load and unload depend on the type of ship. Protects Cargo. When a cargo is brought to the ship, the OS is in charged of securing or fastening it to ensure that it will not be damaged by the constant movement of the vessel. The process of doing this varies depending on the kind of ship. Boat launching and boat recovery. An OS is usually given lifeboats drills to be trained in launching, navigating and retrieving lifeboats. This routine is required in all merchant ships by International Regulations.